a pleasant evening with friends and family. Casa Carmen is a group of restaurants contrasted and dynamic, in continuous growth and with a very solid base. The objective of our restaurants is to give a quality product always in varied menus, cratfed and in constant change. Our team is trained and prepared to serve you in the most accommodating and effective way. The careful decoration of our premises, makes your stay pleasant and comfortable, both for large groups and for dinners or family meals. The objective of our restaurants is to give a quality product always in varied menus, worked and in constant change. Our menus are made with our best dishes to share them with your family and friends. 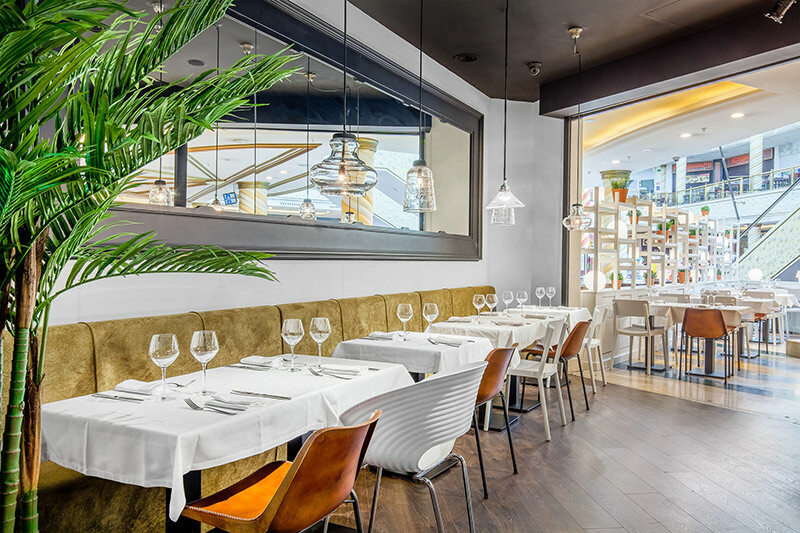 Located in La terrassa del mar, on the third floor of the Diagonal Mar shopping center, our restaurant with outdoor terrace allows you to enjoy a unique location, 5 minutes from the beach, and next to the Forum and the International Convention Centre of Barcelona (www.ccib.es). Our restaurant is located in the center of the city, at two minutes of Plaza Catalunya. In our restaurant, you will enjoy our nice Spanish food surrounded for a beautiful decoration. Located in the center of the city, just in front the commercial center la Ila Diagonal, you will find our beautiful restaurant. You will enjoy a great meal in a bright environment. Located on the first floor, next to the cinema box office, at the Gran Via 2 shopping center, our restaurant is next to the Fira de Barcelona (www.firabarcelona.com/ca/gran-via). Our newest restaurant is located in the incredible commercial center Finestrelles. A new spot located in Esplugues del Llobregat. Casa Carmen Sarrià is located in the big Sarrià Avenue, at five minutes from the emblematic Francesc Macià square. Is a large restaurant with charm and perfect for every type of celebrations. Plaza Norte 2 “La Cúpula de Madrid” is a spectacular mall with the widest commercial offer of national and international fashion with more than 200 stores. It also has 14 cinemas and 6,800 parking spaces for your convenience. isit the new Casa Carmen restaurant in Madrid! Come and enjoy the best food in a spectacular shopping center with the widest commercial offer of national and international fashion. We are waiting for you at Casa Carmen Moda Shopping, in the Moda Shopping Mall. Arturo Soria is one of the most exclusive commercial center in Madrid, our restaurant is located in the first floor, and we offer a varied gastronomic. Visit our spectacular terrace where you can enjoy the best dishes of our menu and our nice cocktails. Parquesur is the biggest commercial center of Madrid and one of the biggest in Spain. It offers a big variety of shopping, leisure and restoration. Casa Carmen La Vaguada is one of the most important commercial centers in Madrid. It was inaugurated in 1983, and was the first commercial center in Madrid, that is why people name it “The heart of Madrid”. In the historic center of Sevilla, you will find one of our most beautiful restaurants. Located just next to “La Torre de la Plata. Our menu is full of typical Spanish dishes that you can enjoy in our incredible terrace. Nevada Shopping is the commercial center of reference in Granada, our restaurant is located in the first floor. The perfect spot to enjoy the typical Spanish dishes with you family and friends. We use our own and third-party cookies to improve our services and show you advertising related to your preferences by analyzing your browsing habits. If you go on surfing, we will consider you accepting its use. You can change the settings or get more information here .